A large variety of seeds may be sprouted for human consumption. In all cases, the vitamin content may be expected to increase dramatically, particularly vitamin C. Exposure to sunlight during the sprouting will further increase the content of this vitamin, but may also result in a slight increase in bitterness in some sprouts. Seeds commonly sprouted are: alfalfa, mung beans, wheat, lentils, soybeans and corn. The unquestionable favorite to eat among my students has been alfalfa. These are excellent raw on sandwiches and in salads. Mung beans are the seeds used to produce Chinese “bean sprouts,” and are superb in egg foo yong and chop suey. Do not overcook these, or they turn to mush. Wheat sprouts are very sweet, and can be used in salads if they are chopped to reduce their stringiness, or included in bread dough to produce wheat-sprout bread. Lentils may be used raw in a salad, but must be used with other ingredients because of their strong flavor. Soybeans are best cooked, or must be used with other ingredients because of their strong flavor. Soybeans must be sprouted with care because, in my experience, they are prone to rotting, and therefore must be rinsed three or four times per day, removing softening seeds, especially those which have split in half. Corn sprouts are best ground and added to cornbread, or yeast raised breads. Moonshiners use them to make mash. In the dead of winter, sprouts offer a means of producing one’s own fresh greens and vegetables, and provide healthful and tasty foodstuffs at a time when vitamin content is lowest in commercial foods. At home, we usually sprout ¼ cup of alfalfa seeds in a gallon jug. We get alfalfa seed from the Landmark Feedmill in Bethel. Verify that the seeds have not been treated with any poisons! Fresh sprouts may also be used for the preparation of chromosome squashes by digesting, staining and squashing the very tips of the roots where mitosis is frequent. 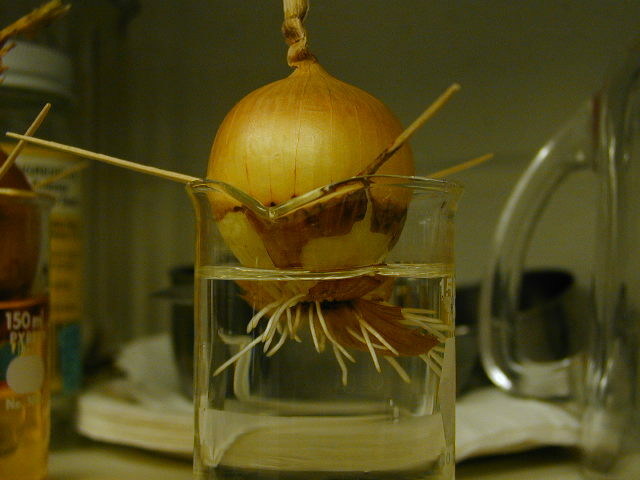 Sprouting onion (suspend by toothpicks ½ inch deep in water, as noted) gives excellent mitotic figures. It can take up to a week to get good sprouting. Measure out suggested quantity of seeds into a wide-mouthed quart jar half filled with water. Measure out these quantities: 1 Tbl (15 mL) alfalfa 2 Tbl (30 mL) of any the rest. Cover mouth of jar with a piece of nylon stocking: Stretch a 3 x 3 inch piece over the mouth, screw on a canning jar rim to hold the stocking in place. A coarse-mesh stocking lets the water drain out better than fine mesh. A rubber band can serve to hold the stocking in place. Fill the jar half full of fresh lukewarm water. Next morning, pour out soaking water. Rinse twice with fresh water and empty rinse water to cleanse the seeds. Place upside down to drain freely. *Avoid breaking the rootlets, or spoilage will result. The seeds should be sprouted to the desired degree in five or six days for alfalfa, and a week or 10 days for the rest. Place them near the sink where you are more likely to remember to rinse them. If exposed to bright light they will develop a green color, and additional vitamins (as well as a trace of bitterness). After they have been sprouted, they may be stored in the refrigerator in a damp towel inside a plastic bag for at least a week.